The modern phenomenon of Street Art was explored during the Creativity Challenge. 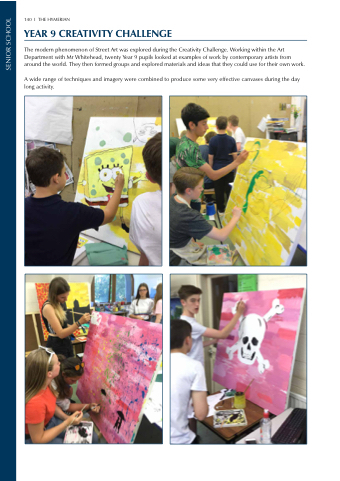 Working within the Art Department with Mr Whitehead, twenty Year 9 pupils looked at examples of work by contemporary artists from around the world. They then formed groups and explored materials and ideas that they could use for their own work. A wide range of techniques and imagery were combined to produce some very effective canvases during the day long activity.